More than 34 million Americans have already cast their ballots. But what does it tell us? Another electoral cycle in the United States culminates today. More than 157 million eligible voters have the opportunity to head to the polls for the midterm elections. The midterms are true to their name - these elections take place halfway through a president's four-year term. Voters are casting their ballots to decide on everything from local mayorships and city council seats to amendments to state constitutions, races for governor and members of the House of Representatives and the Senate. Midterms don’t usually excite as many voters as presidential elections. They require more effort, with nuanced and lengthy ballots that can be complicated to decode, holding many more issues that need attention. And because midterms are usually seen as a referendum on the president, it’s expected that the party in the White House almost always loses seats, especially during a president’s first term. The base of the party in opposition rallies to take back control of the House of Representatives or the Senate, to heighten the checks and balances on the party in charge. The midterms rarely invite innovation and enthusiasm from folks who usually stay home. But just like the presidential election in 2016, this is a vote that’s proving to be agitating and unpredictable. Shifting demographic and political realities, as well as burgeoning national movements, are summoning new participants to the political process and encouraging record-breaking participation across the country. Political pundits and pollsters are hyperaware of how their predictions can falter. But as National Public Radio (NPR) reported yesterday, these elections are already proving historic according to the numbers. Turnout is projected to reach 45-50%. More than $5 billion has been spent on national congressional campaigns, making these the most expensive midterm elections in US history. Part of what has fired up anticipation about tonight’s results is the more than 34 million Americans who have already cast their ballots. This shows a surge in early voting from both parties (34 states and the District of Columbia allow people to vote before election day), already surpassing the record low turnout of the 2014 midterms. Some states, including Tennessee, have seen roughly twice as many early votes this year. The Washington Post reports that in Texas, more people have voted early in 2018 than voted at all in 2014. Early voters are decided voters, so this increase in participation correlates with the growing polarization in American politics. Much of the work of campaigns across the country has been to bring out the base of each party in a battle for the majority. Democrats are especially focused on this strategy as they attempt to prove a #bluewave is coming, with the party hoping to gain control of the House of Representatives. On the last day of early voting, Juan Peñalosa, Executive Director of the Florida Democratic Party (Florida being one of the most watched states in the midterms) shared this tweet. The #bluewave will in part depend on Republicans staying home. However, the numbers tell us the opposite is true. 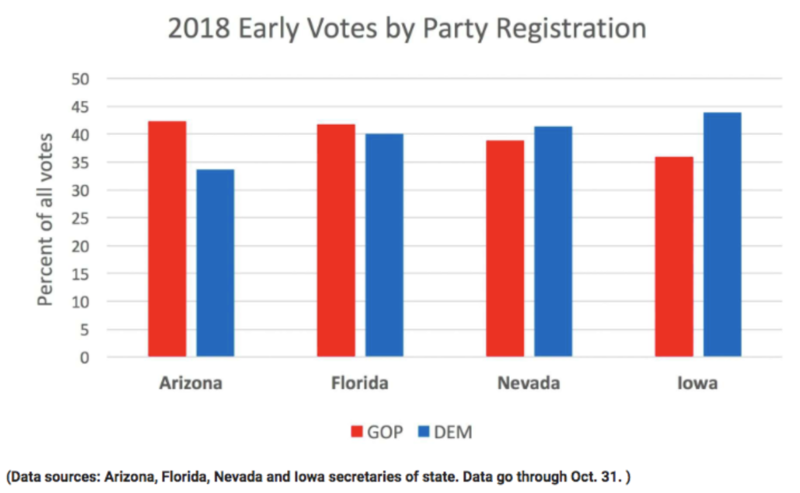 Although Democrats are closing the early voting gap, Republicans have historically participated at much higher rates in the midterms. They’re showing up strong again this year as they vie to retain their Senate majority. In these midterms, everyone is turning out to vote. Not only are the bases of both parties heading to the polls, but we’re seeing new faces on the ballot. Motivated by a host of factors including the #TimesUp and #MeToo movements, women are doing justice to the claim that this is the ‘Year of the Woman’. One of the most notable examples is the stunning upset of 29-year-old Alexandria Ocasio-Cortez’s win in the New York primary race for House District 14. She beat out the long-reigning incumbent, establishment Democrat Joe Crowley. The Center for American Women and Politics at Rutgers University has been keeping tabs on female candidates. This year has broken all records. A total of 476 women filed to run for the House - the previous record was 298 - and 251 are still in the running. Fifty-three women filed to run for Senate seats, beating the old record of 40, and 26 are still in the running. Sixty-one women filed for governor, breaking the previous record of 34, and 18 are still in the running. Another under-reported batch of new candidates are those with diverse professional backgrounds. Most American politicians have a background in law or business, but a national Spanish language newscast by Univision featured a story highlighting a dozen scientists and engineers who are running for Congress as first-time candidates. Adding to the list of fresh faces on the campaign trail is Democrat Stacey Abrams in Georgia, who is the first black woman to be a major party’s nominee for governor. 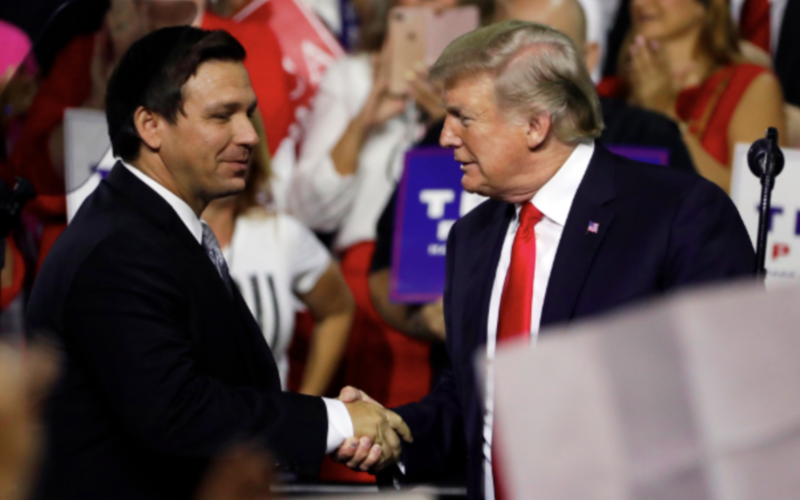 In the Florida gubernatorial race, we saw Ron DeSantis surge less than six months ago, after an endorsement from President Trump won him the Republican nomination in the primary over Adam Putnam, Florida’s Commissioner of Agriculture. Putnam outraised DeSantis and enjoyed a commanding lead early in the race. Joining new faces on the ballot are new faces in the voting booth. Puerto Ricans, who are US citizens but cannot vote in elections unless they register to do so as residents of the mainland US, are being closely courted by both sides. Between 159,000 and 176,000 Puerto Ricans have left the island since Hurricane Maria ravaged it in September 2017, according to estimates from the Center for Puerto Rican Studies at the City University of New York, speeding up an exodus that was already underway due to Puerto Rico’s dire financial crisis. Of that number, some 70,000 to 75,000 settled in Florida. How they will vote has yet to be determined. The March for Our Lives movement has also promised that these will be the elections where ‘young people will win’. The youth activists that started the movement after the February shooting in Parkland, Florida toured the country registering their peers to vote over the summer. For the first time, millennials are the largest share of the electorate. A new poll released by the Institute of Politics at Harvard’s Kennedy School of Government found that 40% of 18 to 29-year-olds say they will ‘definitely vote’ in the midterm elections. The highest rate of youth voter turnout in past midterm elections was 21% (in 1986 and 1994), according to the Harvard report, which cited U.S. Census data. 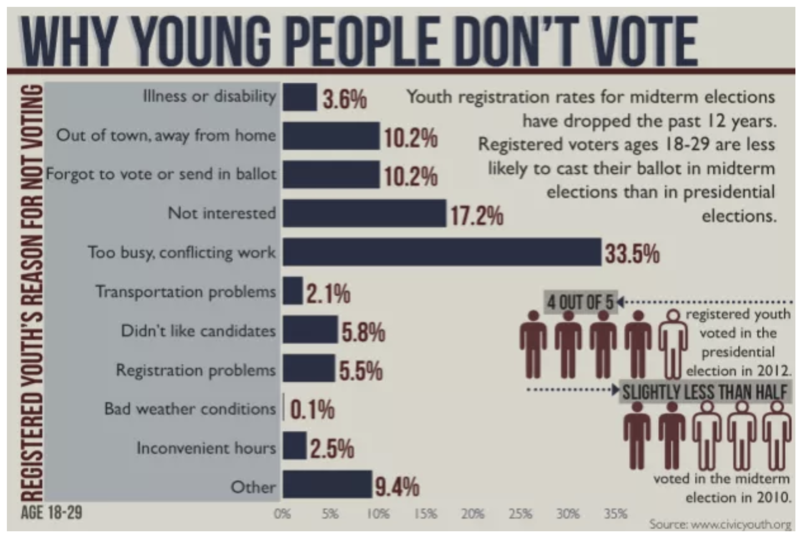 Will young people show up to the polls this time around? Data from early voting shows a spike in youth voting in battleground states, but it’s still too early to cite a youth voting wave. Former president Barack Obama and President Trump - the most popular figures in the Democratic and Republican party respectively - hit the campaign trail this weekend for candidates in competitive races. If we judged this election just by looking at both their exhausting rally schedules, one would almost think it was their names instead of those of their fellow party members that were on the ballot. Over the weekend, Obama repeated his new slogan ‘Don’t Boo, Vote!’ and reminded rally attendees of what he helped set in motion during his tenure as president. President Trump alluded to ‘Promises Made, Promises Kept’, speaking to the current record low unemployment rate and booming economy, and revved up his base with his hardline stance on immigration. Seeing both figureheads crisscross the country to get out the vote is yet another sign of the heightened importance of these elections. No predictions can fully gauge what today’s outcome will be. One thing is sure, however - this midterm election is unlike any that the US has ever seen. Grassroots organizers, party staff, political operatives, former presidents and even the commander-in-chief are pulling out all the stops until the final countdown to get their constituencies to vote. The famous phrase coined by American baseball legend Yogi Berra about baseball's 1973 National League pennant race seems the most appropriate to describe this election: 'it ain't over till it’s over’. As always, voters have the last word.